WIN! 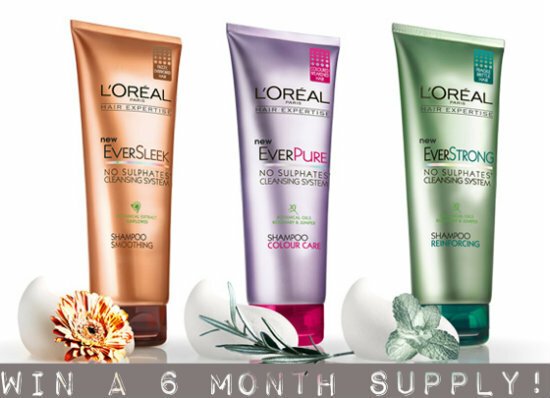 Six Months Supply of L’Oreal Hair Expertise Products! If your hair is calling out for some tender loving care then today’s prize could be just what the doctor ordered! One lucky winner of Fluff and Fripperies will walk away with a whopping six months supply of L’Oreal Hair Expertise products – including shampoos, conditioners, masques and serums. I’m a big fan of this range – all products are silicone and sulphate free, and designed to be gentle on overprocessed hair. It’s broken into three categories - EverPure, for coloured hair, has oils of rosemary, juniper and mint, EverSleek includes sunflower extracts to combat frizz, and EverStrong contains oils of rosemary and juniper to help strengthen fragile hair. If you’re resident in the Republic of Ireland and would like to get your hands on a six month supply of these lovely products, just follow the simple steps below. Best of luck everyone! If you could see the state of my hair you you would know how much I need this. I could really do with this prize!! Super prize! Liked and shared! Lovely, you have us spoiled. my hair is a state! it could do with a treat! God my hair could do with a bit of TLC! These products look great. Thanks for stopping by my blog and commenting. My poor curly frizz bomb hair is in total need of this TLC! Love it! I haven't tried any L'oreal hair products. emma you're really spoiling us with all these giveaways. I haven't tried the Loreal Hair Expertise range yet. Have you tried them? My hair is screaming out for this!!! I always try to buy sulphate free shampoo so would love to try this. I love L'Oreal products and from what you say these are great! I'd love to try them! I'm forever trying out new hair products, looks good! Heard this range is great, count me in! my mop could certainly do with this! love it! make my day!!! My hair could do with a bit of pamering.The seasons and school runs have taken their toll. Now that's a generous giveaway! I've never even seen those products but they look superb! I just ran out of shampoo so could really do with this ha ha! Thanks for the reminded on the FB page - don't know how I missed this. Dying to try the range! Id love to switch it up and try this as my hair is sick of redken! Thanks!